The M'Goun Massif is walking a gem. Think deep, colourful and dramatic gorges separating high and thrilling ridges and escarpments. 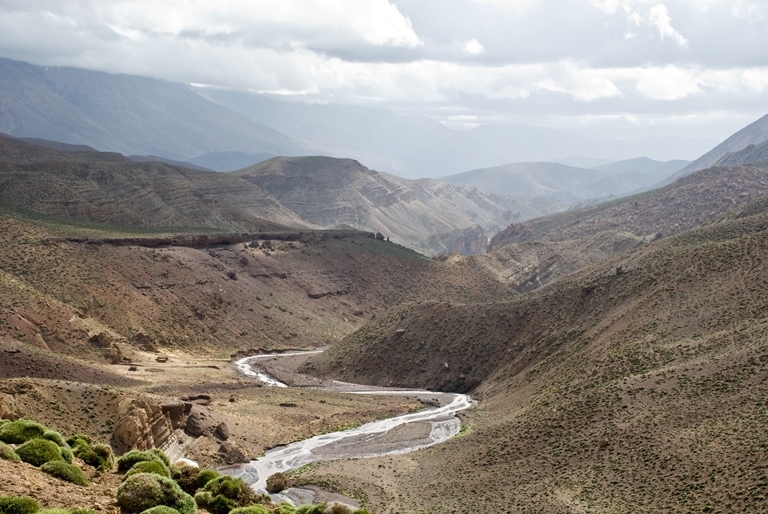 Here you can trek through violently-cut gorges (some requiring wading), barren slopes of scree and forested valleys and visit remarkably unspoilt Berber villages. There is a huge selection of walking, from tough multi-dayers to day-explorations. This can be tough walking in high, remote mountains, on which you will have to be self-sufficient and where altitude can cause discomfort. Come prepared. 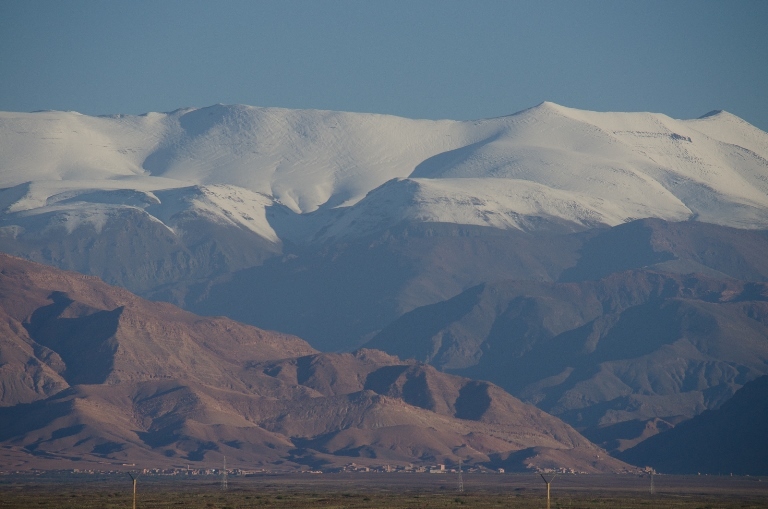 The M'Goun massif, at the heart of the High Atlas, is remoter and lesser known than the Toubkal area, but a gem nonetheless and the great range's second most popular trekking area. 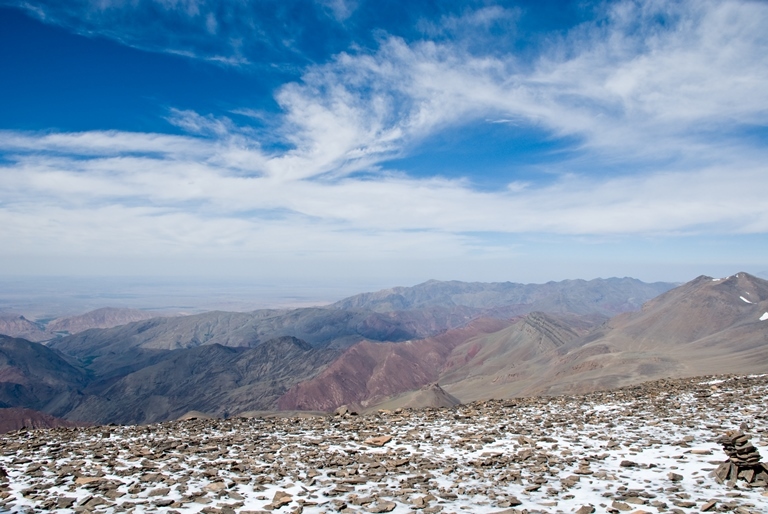 Its high point, Jebel M'Goun (4,071m) (? - there is inconsistency here! 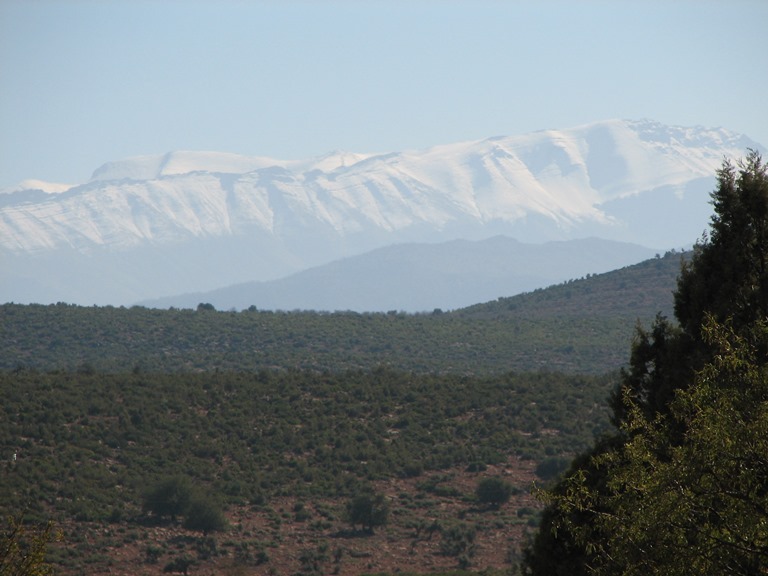 ), is the second-highest peak in north Africa, and one of Morocco's' sacred peaks. 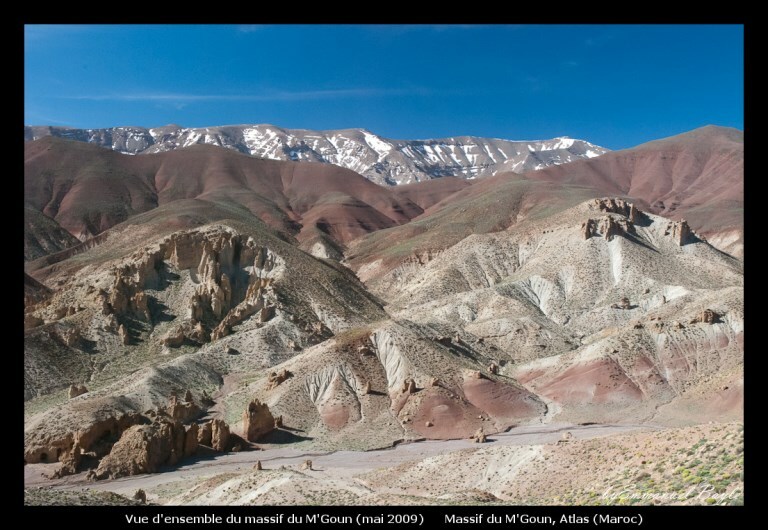 Very different in nature from the Toubkal area, M'Goun is largely eroded sandstone and limestone: think deep, colourful and dramatic gorges separating high and thrilling ridges and escarpments. 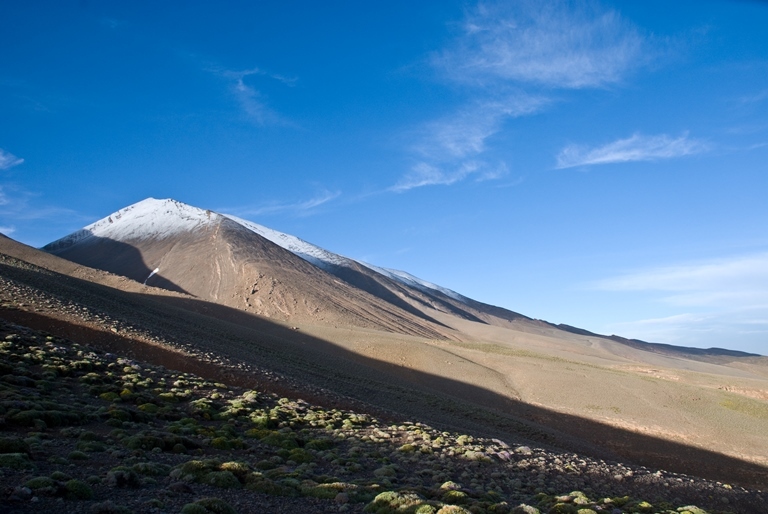 It is a touch less harsh than other Atlas areas, with a bit more vegetation and more prosperous valleys. 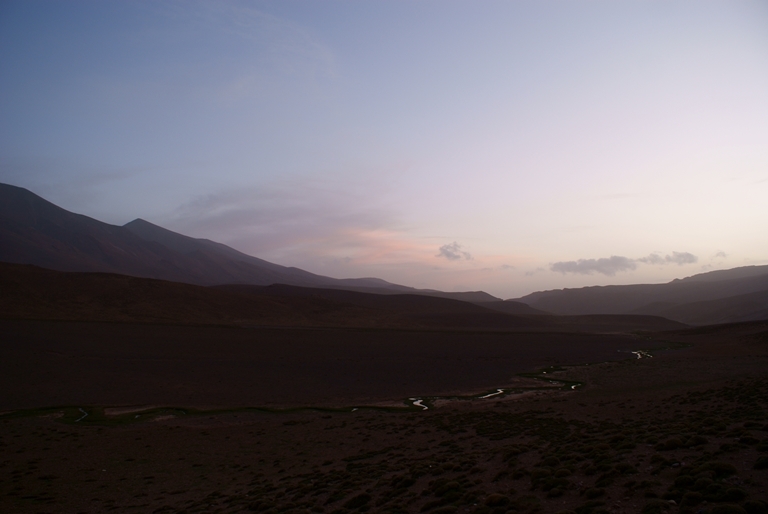 Here you can trek through violently-cut gorges (some requiring wading and said to be only 3m wide in places), barren slopes of scree and forested valleys and visit fascinatingly unspoilt Berber villages - not surprising given many still have no road access, but still somehow remarkable so near Europe. The region gives an extraordinary look at a characterful if hard way of life, which has changed little in hundreds of years. They are thought to be the indigenous inhabitants of the area, and have always been fiercely independent, living in fortified mud-brick villages (look out for tower-houses) in irrigated valleys. Some still practice transhumance, moving with their flocks to high pastures in summer. 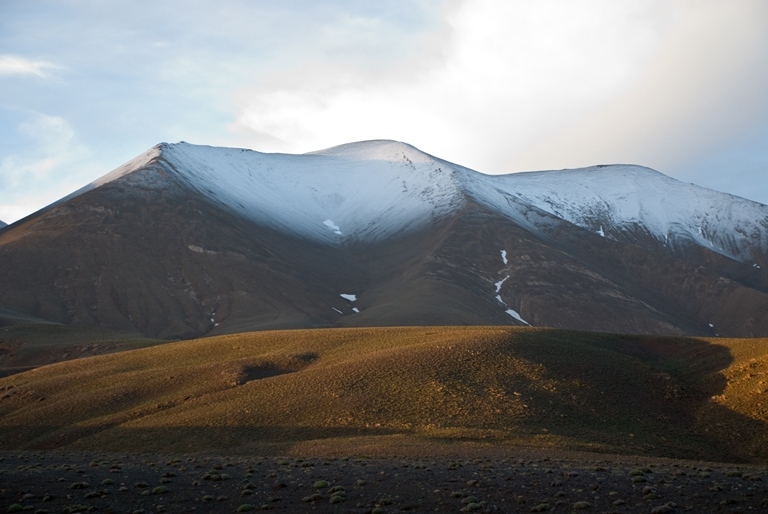 The landscape can be orientated around a main ridge which includes the highest peaks. 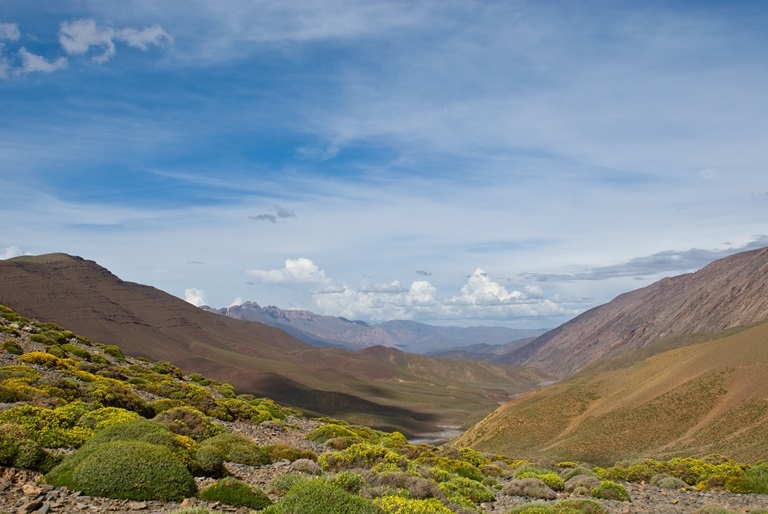 The accessible A?t Bou Goumez valley to the north is the main trek-head, with Tabant the main trekking town. 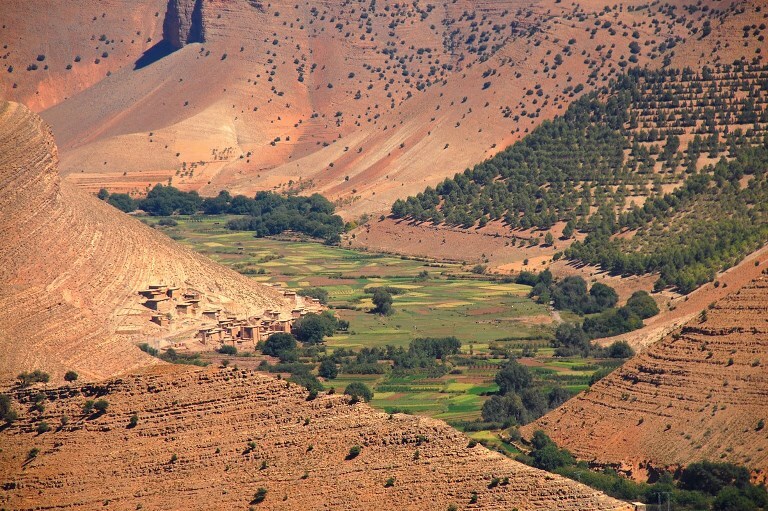 Its fertile, even luxuriant bottom, surrounded by dry, dramatic mountains, supports a rich Berber culture, making it a good place to prepare for or recover from your trek. You can also start walking from roadheads to the south. There is a huge selection of walking (some would argue better than the Jebel Toubkal area), from tough multi-dayers to day-explorations. 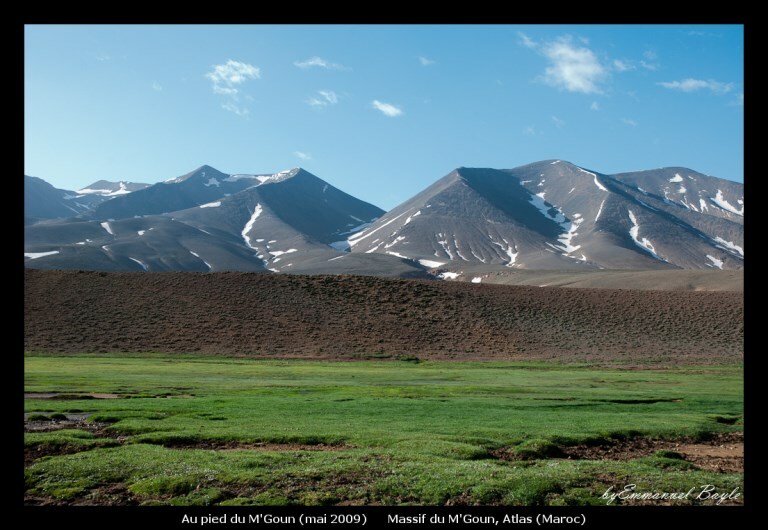 The various versions of the multi-day circuit south of Tabant, taking in the high M'Goun ridge, are well used, with good cause. 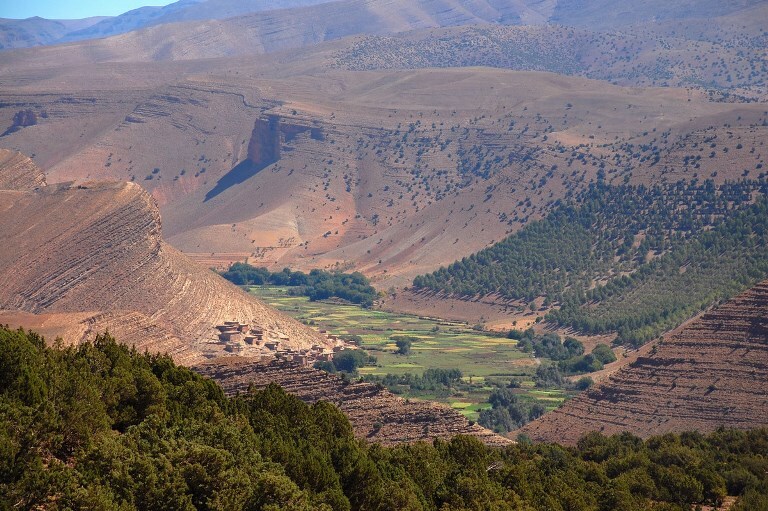 The mix of the drama of high peaks, ridges and passes with deep and pleasing valleys nestling traditional Berber settlements, taking in gorges, the Tarkeddid or Tessaout Plateaux and some outlandish landscape, is inspiring. 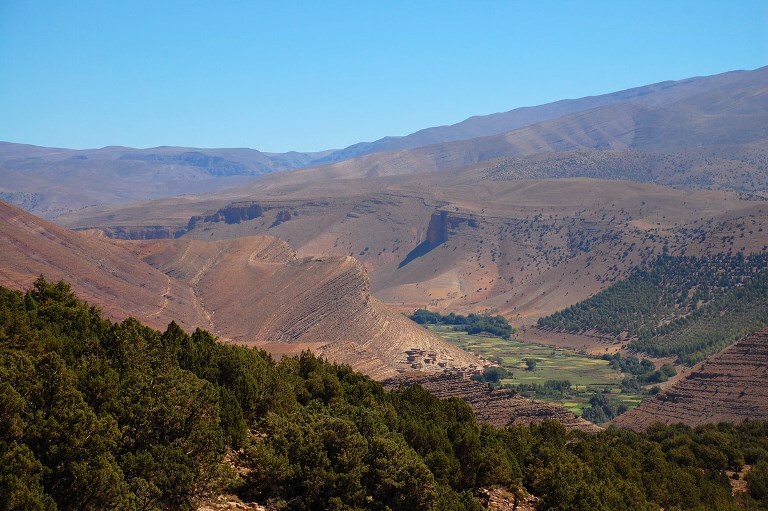 It takes a couple of days, ascending through classic Berber cultivated valleys and crossings a high pass or two, to get to a camp below the central M'Goun ridge. 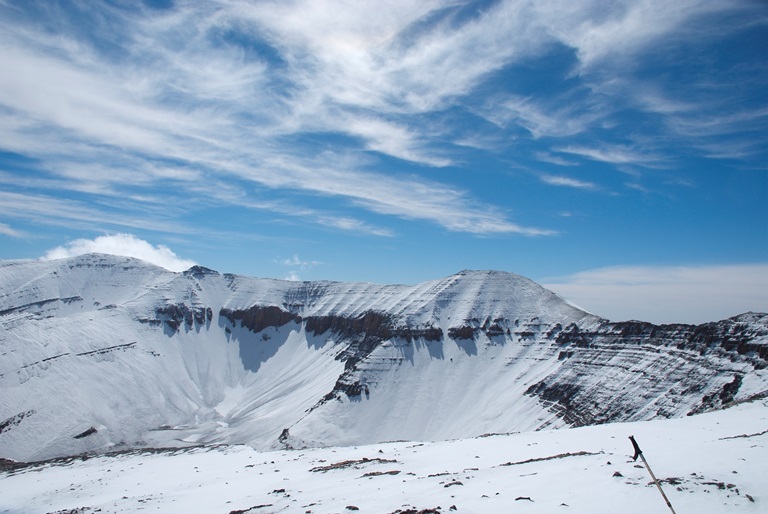 On day 3 you can climb M'Goun's peak itself, a long and tiring day, but a proper trekkers' peak (with some exposed sections). A dramatic day. 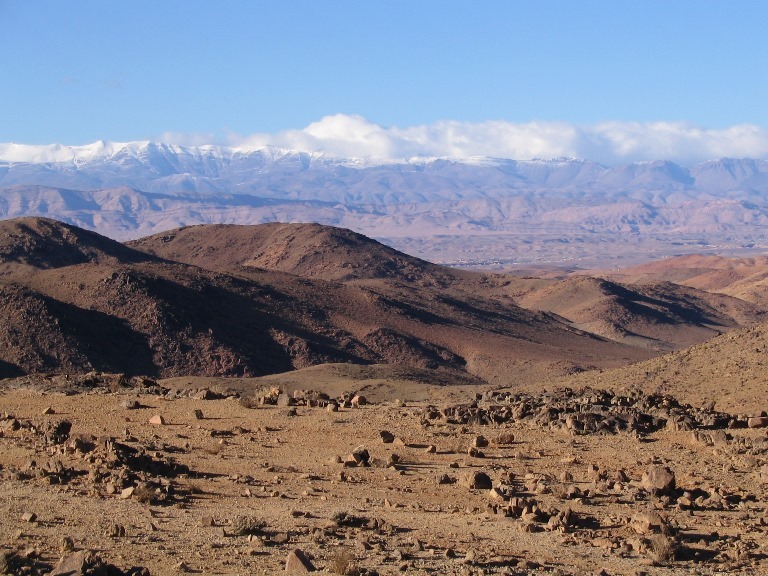 The long day on the high M'Goun ridge, winding below the key peaks, has to be one of Morocco's great walks. Subsequent days take in huge canyons, remote valleys and other delights. 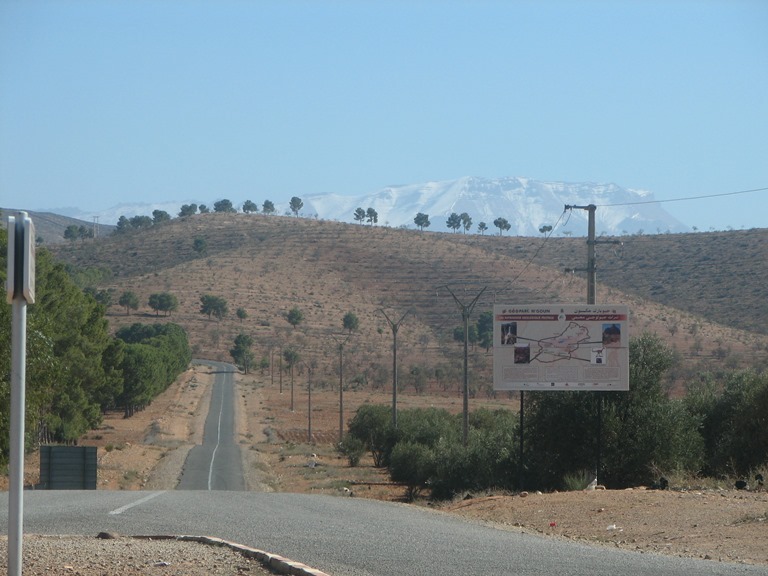 Various forms of Traverse across the range, for instance the six-dayer from Tabant to A?t Tanlil, taking in valleys and Berber villages including Megdaz, claimed to be the most attractive in the M'goun, as well as high country, with big views. Another version is Tabant to El-Kela? M'Gouna, a 6 day route south-east from Tabant. Includes paddling in narrow gorges, so check conditions before you start. There are places to stay (g?tes), so you can travel lighter. From historic Telouet to the south-east, and Anmiter further into the mountains, you can walk to the Tamda Lakes, or on a multi-day circuit to the fascinating, remote Tessaout Valley. 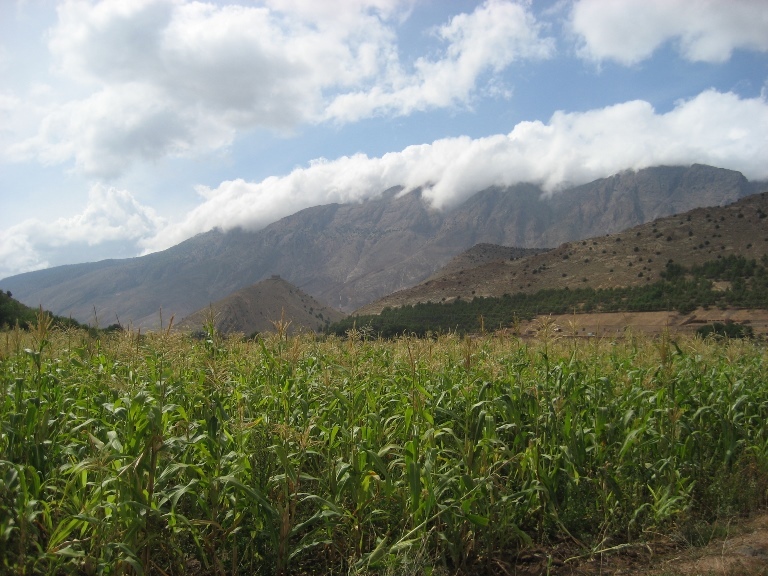 There is interesting day walking to be done around the extremely pleasent A?t Bou Goumez valley to the north, for a good taste of traditional Berber life. For instance the 3 hour village circuit, the Trailblazer guide has christened the Randonnée du Thé. www.tourdust.com organise an expedition here : we have travelled with Tourdust, and were delighted. They were very nice and flexible to deal with, and evidently cared about quality, as their walk was meticulously prepared and our support team were outstanding in every way. We are proud to be their partners. This page is at an early stage of development. Please help us by recommending your best walks and making suggestions and sending photos! Thank you!